Renowned Scottish sculptor Andy Scott, holds rare exhibit : June 10th – 26th, Glasgow Caledonian University, 64 Wooster Street, NYC. A rare exhibit of renowned Scottish sculptor Andy Scott (sculptor), is now on show at the New York campus of Glasgow Caledonian University, 64 Wooster Street, NYC. The show runs now through June 26th. The exhibit through a series of bronze sculptures and sketches, shows us Scott’s love of the horse, especially the large working Clydesdales. 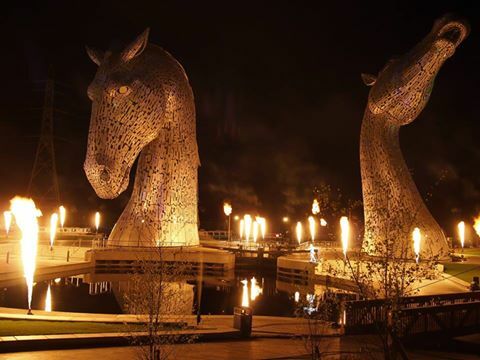 In 2014 Andy Scott’s completed his largest public work to date when The Kelpies, the largest equine sculptures in the world standing over 100ft tall, were unveiled at the Helix Park, Falkirk. Scott normally presents LARGE public works, and for this show he is presenting twelve bronze sculptures and two wonderful larger steel pieces. These are shown together with maquettes (scale models) of some of his famous public works. Also on display are sketches and drawings showing the process for making his landmark public figurative and equine works. 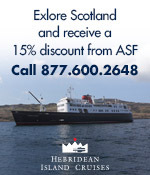 Scott in recent years, produced some of Scotland’s leading art in the public space. 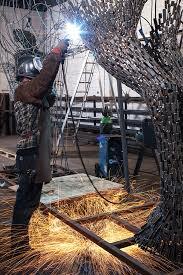 In addition to the Kelpies he has created Arria in Cumbernauld, Ravenscraig’s Steelman and the Heavy Horse. In addition to the smaller series of bronze sculptures for the show, Scott has also been collaborating with renowned silversmiths Hamilton & Inches and cabinetmakers Method Studios. Together they are developing a bespoke sterling silver chess set to mark Hamilton & Inches’ 150th Anniversary. All the chess pieces will be based upon the horse. In Spring 2014, The American-Scottish Foundation® in conjunction with Andy Scott and Falkirk Council, worked to bring the Kelpies maquettes to New York, where they took up residence for several weeks on the Fountain Terrace of Bryant Park. They looked very “at home” on the Fountain Terrace and many of us wished they could stay but they had to continue their world travels. 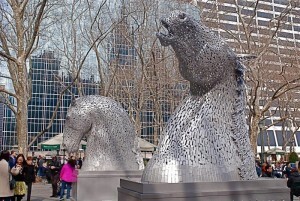 This entry was posted in Associate Events, News, Scotland-Tartan Week and tagged American Scottish Foundation, Andy Scott, Bryant Park, Falkirk Council, GCU NYC, Glasgow Caledonian University, The Kelpies on June 10, 2016 by Camilla Hellman.